You made it to your last semester! Holy moly. Congrats! Graduation season is among us. While going to class, joining all sorts of clubs, going to parties and bussing tables all these years have been a great deal of fun (we hope) something tells us you’re probably ready for the next chapter in your life. At the very least, you’re ready to end this one. Congrats on making it to graduation. It was no easy feat. Long study hours and epic final exams were just a tiny piece of the pie. Now it’s time to celebrate this epic accomplishment and get that shiny degree. Graduation is kind of a big deal so why not share the big news with everyone you know with graduation announcements. If nothing else, to share the big news. It’s also a great (if not subtle) way to let folks know you’re open for graduation gifts — because adulthood is not cheap. You’ve worked hard. Now go show it off. 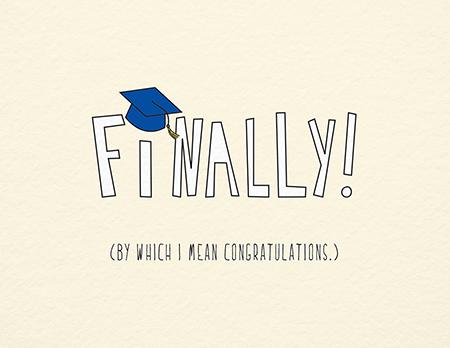 In the meantime, we’ve gathered some of the internet’s GIFs that perfectly describe how it feels to finally graduate. No more having to memorize endless chemical reactions, historic dates and algebra formulas. No more 8am lectures after long night at work. No more 8am lectures after a night out. No more all-nighters. More sleep.